PALMDALE – A key component of the ongoing misinformation campaign led by R. Rex Parris and Marvin Crist against the Palmdale Power Plant has been fear – fear of killing children, fear of imaginary six mile high clouds of pollution that float over schools and soccer fields, and fear of job losses at Air Force Plant 42. The FACT is the Air Force, Lockheed Martin, Northrop Grumman and Boeing DID evaluate the impacts on their future plans and operations and wrote this in their letter to the CEC: “after review and analysis of the placement, and air quality rules, regarding the planned Palmdale Hybrid Power Plant project, we, the Air Force and our Plant 42 contractors, Boeing, Lockheed Marin and Northrop Grumman, are unable to identify any issues or impacts to our current programs and operations at Air Force Plant 42. Not more than a month after Crist’s “prophesy,” the Los Angeles Times reported that the Pentagon’s weapon’s buyer Ashton Carter visited Palmdale and met with Northrop, Boeing and Lockheed executives about the military’s plans to build a fleet of radar-evading, long range bombers that are slated to be ready for the mid 2020’s. For more information on the Palmdale Power Plant, visit www.energy.ca.gov/sitingcases/palmdale. 71 comments for "Palmdale: Power Plant no threat to Air Force Plant 42"
Can anyone on here tell me where the transmission lines for the project will placed and what neighborhood will have to look at them? Come on guys this project needs more community public input! I’d like to thank the AV Times for this form and a lot of information and thought has been exspressed and I hope the public can get some more answers, an our represenatives hold public meetings on this issue if they really care. It maybe the greatest project, or turn into one, or it could be horrible and should be built further east ??? The gas line is on Ave S that it needs too hook up to why that site? Might be “THE Plume ” will head straight for the BLVD or Lancaster City Hall.Might leave the soccer kids and the poor folks alone.Might have a mind of its own,who knows? The ‘plume’ in their minds is a solid mass that moves over the border to Lancaster and just sits there permanently forever like a black cloud. Ha ha, where’s Joe Btlfsk ? The plume will hardly bother anyone on the BLVD. I was there yesterday at noontime and it was practically deserted. Some places are even closed on Mondays and/or Sundays or don’t open till 4 PM. Avenue K does more business. What a vital and vibrant place this BLVD is a couple hours a week. Meanwhile the Mall is thriving. HEY REX!!! WE GETTING A BREAK ON OUR BILLS WITH THE LANCASTER SOLAR FARMS OR THE LANCASTER RECYCLING PLANT? Didn’t think so. Why does Rex keep talking about Palmdale residents not getting a break on their bills? Because that’s what Palmdale told it’s citizens that it would lower their rates. Lacaster City will recieve compensation thru their agreements. AV should form a Valleyeide CSD (comuunity service district) before we give it all away to outside company’s beifiting from AV’s resources without benifiting its Citizens! AV leaders should help its citizens with lower bills. If Riverside can do it why not AV. THAT’S RIGHT! AV leaders SHOULD help their citizens with lower bills. Since Lancaster has ALREADY built solar farms, I guess the citizens should be expecting lower electric bills any day now. Waiting….waiting….waiting…..
John Mlynar defends the power plant with facts. What do you have? Opinions created out of thin air??? Speculations??? “Smoke” I really don’t think there will be ‘smoke’ but it sounds terrible and that’s why you chose that word. Does ‘smoke’ appear over your natural gas stove or from the exhaust pipe of your natural gas furnace? Only if you burn the steak, lol. Sheesh. We can have all the burners of a natural gas ccoktop going full blast indoors for hours SAFELY with nobody dying. It will warm up the kitchen however. Come on, Michael Rives, supply some ‘facts’ if ya got any. Otherwise, your comment makes you appear foolish, y’know like Parris and Crist look foolish. You mean Marvin “the RAT” Crist. Sorry Michael to pop your bubble but natural gas does not produce smoke when burned. If it did we wouldn’t be able to be in our homes with a gas water heater, furnace, or stove. Remember the old gas refrigerators. And even Gas lights in homes before they were wired for power. Burbank has a natural gas power plant right in the middle of the city next to homes and parks… And so does Pasadena. Ask rex what is the body count in those cities. I can tell you it’s ZERO. I wonder who else Rex will try to bribe to spread his LIES. It’s the volume that is the issue and YES the gas burnt in your home does in fact produce the same pollutants as a turbine would. The BIG issues are both volume (ppm[parts per million]) and the stoichiometry of the combustion event. At the scale of burning a flame on the stove the combustion event is well balanced and leaves almost no measurable pollutants, but even over time they can build up to dangerous levels. There is a reason why you should not heat your home with an open flame, people die from asphyxiation. When there is no oxygen to breath…WTF do you think takes its place? cotton candy? flowers? sugar and spice.. Burning gas on the stove at atmospheric pressure is almost nothing like the combustion occurring inside of a turbine engine. The stoichiometry of the air and fuel mixture is completely different and it does in fact produce a lot more pollutants.. to the tune of 7784 pounds of it every day. That’s not moving 7780 lbs of air, but after the combustion event when ‘all’ activity has taken place there is a toxic waste that if put in a container would weigh 7780 lbs. This is a FACT: The Palmdale Power Plant in accordance with the EPA regulations (at the time it was approved) can produce 7780 pounds of pollutants every single day or a total of 680 tons per year. How are those pollutants diluted into the atmosphere? Through the exhaust stacks in the form of a cloud of smoke that will travel the direction of the wind. Now it may be totally transparent and probably not even smell but the fact is that 7780 pounds of pollutants will enter our direct atmosphere every single day. Don’t be stubborn and respect the fact that people in this community have honest and real concerns about the stuff getting put in the air..
Uh… Lack of oxygen is not the same as smoke. I think you need to get some new glasses adam. I think Adam has a lack of oxygen to his brain, that would account for his lack of rational basis in this discussion. What is in place of the oxygen? Magic beans? The Higgs boson? Cotton Candy? No, it’s over 7000 lbs of carbon and other particulates suspended as a mixture that occurs as a result of a combustion process. What does science call that accumulation? Give it up, Adam Chant. You have no credibility here any more. Since when does your perception of my credibility or the credibility of anyone for that matter influence their ability to contribute to the discussion? @Adam Chant Look at some of the replies to your comments. You cherry pick some numbers here and there and think you’ve created cold fusion or something. The power plant has passed many steps in the approval process and, yet, you Parris and Crist just throw out whatever you can to see what sticks without evidence or sources. But, it’s not part of the official evaluation, just your, I wouldn’t even call them ‘opinions’. Parris and Crist no longer have any credibility regarding the power plant, just big mouths. Do you really want to join THAT chorus? BTW. Perception has a lot to do with a person’s credibility. Take the ‘birthers’, for example. You can keep ‘contributing’ to the discussion but the perception of your comments has begun lacking any credibility. Continue if you must. “It would depend on the person’s size and how active they are. Find the CO2 rates for an hour during sleep and being awake, multiply them by whatever you need and you’ll figure out an annual estimate. From Wiki – the breath rate is 12 to 25 per minute. Size of breath is 500 mL. Percent CO2 exhaled is 4% so CO2 per breath is approx 0.04g ( 2g/L x .04 x .5l). CO2 (25 breaths) = 525 Kg/yr. Now, let’s multiply that times the 500,000 people who live in the Antelope Valley for a grand total of 500,000,000 lbs or 250 tons. I know. I know. In your mind 680 tons of a gas seems like 680 tons of lead or concrete to you. You, Parris and Crist think it’s all gonna land on Lancaster’s east side like a big solid block of carbon and remain there. Golly, Adam. That sure sounds like a lot but my point is that your numbers create an exaggerated ‘perception’ of the amount of discharge from the plant and you know about ‘perceptions’, right????? Just on the issue of CO2.. We could only wish that it produced just CO2 from the result of the combustion process, but in fact it does not. There are other pollutants created as a result of the combustion process and the volume of those pollutants depend directly on the operating conditions of the turbine. They are all many times less than the CO2 produced, but they are produced. The point is that pollutants will in fact be produced and were approved by the EPA to enter our atmosphere at a rate of 680 tons a year. Also (AND MY POINT) there are ways to mitigate the pollution and even requirements to do so (Clean Air Act 4-2011) by the government. The solutions are all less expensive to implement BEFORE a plant is built and I don’t think they have been really considered since the plant was approved years before the newest Clean Air Act. If nothing else there is still time to integrate a carbon capture system that would all but eliminate the CO2 released. AND with the oil boom about to happen in California a lot of CO2 is needed..
Go back to the drawing board NOW before we are forced to meet the strict emissions requirements of 2020 (additional cost) and build the plant right. In other words, a power plant could never be built due to the long start up time and reviews that take years and by then newer, stricter regulations will be in place and you’ll have to start over. You’ll never catch up given the time lags between a current design and future stricter regulations. My point was that although you attempted to make your numbers sound huge, so does 1000lbs a year for 1 person exhaling CO2. You’re doing the same stuff Parris and Crist are, replacing EPA studies with your opinions and speculation as though your ‘plan’ is the one that should be selected. Why weren’t you hired to design the plant? In your own comment, you say that the other ‘pollutants’ are 680 tons. Does that include CO2 or are the pollutants you speak of a small fraction. In that case, you are exaggerating the amount of other pollutants by saying they are 680 tons instead of their actual weight. Also, what about the Burbank power plant in the middle of the city surrounded by mountains without the dispersing air currents we have in the Antelope Valley? Uh….we need cleaner sources of electricity now as much as we will in 2020 and 2030. Build it now. Put people to work now. Move forward now. Produce electricity now. Stop the insanity. We are looking exactly like what they say we are down in LA. @William – Total pollutants allowed is 680 tons that includes all of the pollutants. Some are extremely dangerous in even small quantities. Yes they all dilute in the atmosphere, but there will in fact be areas of concentration that originate from the power plant. If you live directly down wind of the plant then there is no doubt that those pollutants will impact your life. I’m not preaching about some death cloud here, I’m just saying that the plant is producing a pollutant and it just so happens that it can be packaged and sold on the open market. @Captain Obvious, The Palmdale Power Plan is subject to the new pollution requirements outlined by the Clean Air Act as it is part of a larger system of power plants that have to work together to lower the overall CO2 output across the state. Some of the projected solutions are to run cleaner plants (natural gas) more often than coal powered plants and require all plants to use physical pollution mitigation solutions.. like a carbon capture system. So by the time the Palmdale Plant will be up and running it will already be required to have a carbon capture system as one of the steps to meeting the 2020 Clean Air Act. It’s an undisputed fact that it costs more money later to install a carbon capture system than it does during the initial construction. I agree 100% build it ASAP, but it’s a fact that changes will have to be made to the plant to meet the new law.. either do it in the planning stage for a small fortune or pay a large fortune later in down time and retrofit costs.. Will that also be on the taxpayer’s dime? I really hope not..
Why would taxpayers have to pay for modifications of a privately owned company? Makes no sense. You tell me who is going to own and operate the Palmdale Power Plant. Adam, I readily admit I know nothing about the perceived dangers of this power plant. I have dismissed Crist and Parris as windbags with ulterior motives, but you appear to have real concerns with no motive. Where are you getting this information? Where can I find it? I would like to be more informed outside of the propaganda being spewed from both sides. i agree – (quote) I have dismissed Crist and Parris as windbags with ulterior motives (unquote) totally agree! So forget about the windbags- its a power plant- does it have smokestacks that spew some stuff in the air? Well I think we all agree that if that’s true that it CANT BE GOOD! So just how bad is it? Is it something we can all live with? Do you trust government agencies to decide what “acceptable” levels of pollution are? I don’t care about this issue as stated on a previous post. There are many things that can kill or harm us in this world, and even though I hate to see more added to the list, I am forced to focus on those that are most likely. power plant is not on that list. Letlow, I don’t consider ‘facts’ published over and over by Mayor Ledford and John Mlyer equivalent to the wild doomsday scenarios put forth by Parris, Crist and now Adam Chant. Crist’s 6 mile plume??? Killing children???? Negatively impacting Plant 42 when the entities associated with Plant 42 have already said they were OK with the plant, yet, Parris wants more evaluations by them which they’ve already done just so he can delay and obstruct. Do you also consider the arguments that people who denied the Holocaust or our moon landings to be considered equal but opposite to evidence provided by the other side? So, please don’t equate Palmdale’s publishing of studies, approvals and reports by various agencies who worked on the power plant for many years to be the same kind of ‘propaganda’ that Parris, Crist and Chant are putting forth with no evidence to back up their imagined assertions. They are not equivalent. wow – if you actually care about this issue, then consider yourself lucky. Be glad you don’t live a life where a car breakdown could cripple your world, where you can’t go outside after dark because the gangbangers who live in your own apartment complex will rob/assault/kill you. I envy you all – you have the luxury of picking some pansy cause to back, while those less fortunate have to worry about real issues that are life and death. Sammy I am liking you more and more each day. You might call it elitist,but these things do need to be evaluated for their impact on the environment. However, it seems that has been done better than Lancaster city council vetted Stan the man Muhammad. This project was not a very public input involved project and that is why there is a problem with it! Will not lower Electrical rates for Palmdale Citizens as was advertised. So why did the city pursue this project when they were cutting senior citizen and recreational recreational programs. To make one company rich! Did not pursue other alternative site to the east of Palmdale that would have not put a toxic plume over Lancaster. City of Palmdale looks as they maybe cutting fees that should be paid by the company. This project would create almost as many local construction jobs as if the project had no polluting gas element. And would create more jobs if panels where built locally. No mitigation measures in trading prime desert land that will be destroyed by project. Still has not addressed transmission lines that must run through Antelope Valley to the project and the local impact. A project of this magnitude needs to be taken out of the hands of the Palmdale City Council and be headed up by a Valley Wide Commission because the project just does not affect Palmdale it affects Antelope Valley and it needs to be even more transparent to the public. Or we might find out the next day that AV citizens spent $5 Million and own 60 acres of land on top of the San Andreas fault line for a Palmdale College like we do today..
TRex, is that you, or maybe Marvelous Marvin. On the FUD rating scale, this one is only a 2, even TRex and Marvelous Marvin does it better. Why did Lancaster give 8 million to Frank Visco to cover up a trench in Lancaster when our bond ratings were in the dumpster and we had almost no fiscal reserves. Oh wait, It was Rex’s buddy that’s why. Wow… That was a truly pathetic attempt of clouding issues. I don’t think that you’re gonna get full credit on Parris’ payroll for that posting, buddy. Are you the same Jason Zink who popped rex t the gym? Why would you support him now?I smell a rat. No….not supporting him supporting AV! This is probably both mayors last terms, looking to the future.Don’t like the fighting. The Power Plant probably is why the Mayor is running this last time to retire this is a Billion $$$ Dollar Project. Crist and Parris are an embarrassment to both Lancaster and the AV as a whole. Why do people elect these clowns is beyond my understanding. It makes me wonder who took the bar exam for Rex. Clearly he is too ignorant to have took it himself. They both use make up facts as their reason to not support. One question/concern: the inset photo appears to show mirror-type solar reflectors, so I infer that those are the technology proposed for this facility. It is true that solar reflection mirrors can create glare. The small “demonstration” facility at Ave. G and Sierra Hwy created an insane glare on especially the western steam generator tower for the first few years after it was built; you could see the glare spot from Edwards AFB and it was definitely a distraction when driving along the 14 freeway. For the last year or 2, I haven’t noticed the glare anymore, leading me to wonder if they modified the design or have virtually shut down that plant. Does anyone know about that plant? The solar panels at Hillview Middle School in Rancho Vista have apparently created such a glare problem for homeowners across the street along Rancho Vista Blvd, that one homeowner has hung several vinyl banners across their back fence protesting the panels and demanding their removal. And that leads me to the real question: will the city of Palmdale or the contractor guarantee this power plant will not create any glare? Just imagine the risk to test pilots of blinding glare!!! uh.. you are not allowed to post logical objections or evidence supporting such issues. Like that there was in fact an accident this week from the solar panels on Rancho Vista Blvd, near Hillview. The reason you cannot keep asking questions that have already been answered is because a approved permit has been issued. Mr. Chant needs to do his homework. I looked into this very issue and found out the Air Force did indeed do a glare review of this very issue. Turns out there was no impact to the mission or from glare. Some people refuse to read the facts even if they are right in front of them. The unit at Ave G uses a field of flat mirrors to focus light on a central tower. The tower glows from the amount of excess light being thrown at it. The Palmdale sketches are showing a curved mirror trough with a pipe running down the focal point of where the sun will be focused. It will not glow like the tower because less sun is focused on a particular spot. If you want to see this system in use head out to Kramer Junction (Hwy 395 and Hwy 58) and look north. There is a unit like this in use. If it is still operating Solar One in Daggett, CA (just east of Barstow) is a large scale tower reflector. Thank you for explaining and the best response to my question of any of them here. Dagget has been decommissioned as far as I can tell and anyone notice that esolar isn’t running anymore. Could it be that the mirrors faulted one day and almost blew up suburban propane next door. Rex Parris causes more air pollution every time he opens his mouth than the dirtiest coal-fired power plants. Where is Parris’s and Crist ‘evidence’ for anything they say regarding the dangers of the power plant. They aren’t being held to that standard by the local media such as the AV Press and TWC Channel 3. Forget the pollution. 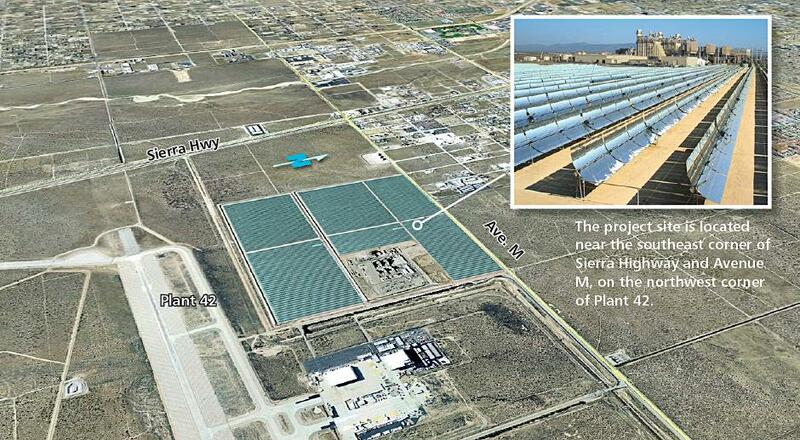 Does Parris secretly want his solar farms to be the ‘monopoly’ on energy in the Antelope Valley without a Palmdale power plant? I wouldn’t be surprised if that is the real reason they oppose it. ya – I also wonder whats really going on, it looks like Rex has an agenda that he’s not sharing – and money must be involved somehow. I sent TWC Channel 3 this article and asked Mitchell Chase who does weekly interviews with both mayors, to ask Parris for his source of information when he spouts off his doomsday scenarios. Where did he get information that the power plant was going to negatively impact Plant 42? Did he simply pull it out of his rear? Parris wants to suspend the hearings till the parties involved have evaluated the impact of the power plant. Well. it seems they’ve already done that. He’s a lawyer and doesn’t want to ‘lose’ this one and will do anything and say anything to win at this point. It’s not really about the impact or the pollution, it’s about ‘winning’ for Parris. How about this.. Have Michell Chase ask Ledford why the city of Palmdale has spent $35M on the development, yet only are selling the plant for a maximum of $27M, but have taken a whole $500K deposit for only 50 acres of a facility that requires 300 acres to operate? Or How a planning checker can declare the cleanest plant ever approved by the EPA, but this individual is only responsible for planning in one district.. I think everyone is tossing whoppers around on this project and not enough people are actually answering the hard questions. I speculate that the reason Lancaster is getting involved in the discussion is because the credits that will be required to be purchased for this facility will make it that much harder to get any additional credits should other manufacturing and industry try to move to the A.V. Maybe Morton Manufacturing needs credits for their factory and if PPP gets them then it means that there are fewer (if any) available. We all need to take a much closer look at the credits situation because I think we will find that when it comes to usage vs jobs there are other more beneficial solutions out there. And it rolls back to this.. redesign the plant with a snubber and produce.. almost no pollutants.. and the ones that are produced are sold on the open market to oil and building industry.. So, you don’t dispute that Parris pulls his opinions about the effects of the power plant out of the thin air in his head and doesn’t offer any evidence for them. The entities involved with Plant 42 are fine with the power plant, yet, Parris wants to suspend the hearings till those entities evaluate the effects which they’ve already done. Parris is nuts and that’s the kind of stuff I asked Mitchell Chase to address when interviewing him. Ask for sources for his claims. In your first paragraph, has Mayor Ledford lied or made factfree statements like Parris constantly does? You might not like the financing of the project but that’s not what I’m talking about. That’s what I was writing Chase about; Parris’s chronic BSing. Then, you further undermine Parris by speculating on the real reason Lancaster got involved. Oh! So, it’s not really about killing children on the east side???? Adam, those numbers are not accurate. The $35 million include the entire 600 acres of the property that was purchased from Lockheed. There will be 300+ acres available for future industrial development, and there is interest in the land already. That number does not factor in the $5 million annually that the power plant will infuse into the local economy, nor the $6 million in taxes that go mostly to the county. It does not factor in the fact that the power plant will pay millions for the paving of roads and the interconnect for the Palmdale and Lancaster recycled water pipes, which will help bring recycled water to the entire valley. Yes, the EPA called it the “cleanest plant they have permitted in the country” and feel free to discredit that. They also called it a “model” for power plants in the nation. There is a lot of great information available at http://www.energy.ca.gov/sitingcases/palmdale in case you would like to learn more about the project. This Adam guy loves to talk in general terms that promotes a untruth, I would almost think he is inventing reasons to not support this project. He must be supportive of high unemployment of our region. @Adam Chant, are you going to acknowledge the misinformation you posted that John Mlyner addressed in his reply to you. Do have have links or sources for you assertions or are you just going to leave them on this site as though they are true and accurate to misinform the easliy misinformed im this Valley. If you don’t respond, it’s totally appropriate to dismiss any further posts by you as not being trustworthy. Is that what you want, to be includes with Parris and Crist who routinely make inaccurate statements if not outright lies to get their way? Just becuase you don’t like or disagree with something doesn’t automatically make your ‘opinions’ true or credible without backup facts. Sorry I have responsibilities outside of sitting here and posting rebuttals to B.S. answers pooped out by every single person who thinks that just because they have the ability to convey a thought that it’s accurate or even worth addressing. Also have you ever thought that I lose no self worth by trolling softball questions so that the information (that in some cases is more damming) can be provided for people to see.. The city of Palmdale hired a tap dancer.. so what? It seems like dancing with the stars is a pop culture thing these days..
To address the money issue there are FACTS and then there is speculation. 1. Palmdale did spend $19.1M on the 600 acre property. 2. Only 300 acres are necessary for the complete power plant. 3. Only 50 acres are currently being purchased with the option for 50 more down the line. 4. The remaining 300 acres will be available for commercial/industrial use. Only about 70 acres are necessary for the actual turbine portion of the power plant. The remainder of the 300 acres will be for solar generation. How much the City of Palmdale eventually sells the remaining 550-500 acres is totally based on speculation and even if we used the Auto Mall or even the AV Mall for an example it could take anywhere from 5 years (when the PPP could be up and running) to 20 years (how long it’s taken to populate the Auto Mall surrounding lots) to occupy it. So giving Palmdale the benefit of the doubt there are 300 acres of land that is on the general fund budget that is costing the tax payers money. This will continue to be the case for many years into the future. The numbers are not in dispute, it’s the fact that there is a lot of “positive” speculation on this whole project and that speculation is on the backs of the Palmdale tax payers. Why would they only have 50 acres in escrow wouldn’t that tell you they have no intention of building the solar part of the project??? You posted a bunch of unsourced FACTS with no links while saying you don’t have time for rebuttals to other’s comments. Yet, you expect someone to track down your FACTS to verify them. That’s what I was asking Mitchell Chase to do that you ignored while changing the subject to Mayor Ledford. I asked Chase to ask for sources for his information on the power plant and any other things he opens his mouth and lets fly. What a hypocrite you are. You do the same thing that Parris and Crist do. This power plant is an old idea. A new and cleaner energy source should be considered. Why was this particular site chosen? There are plenty of areas away from heavily populated areas as well as not in a busy travel corridor. No matter what Palmadale or Lancaster state, I heard enough to believe that this is just a vendetta between Mayor Ledford and Parris. Just my opinion. Do you have the same concerns about the complaints that the solar farms have caused with the dust storms by neighbors in that area? Here’s hoping Palmdale addresses Rex’s concern about the power plant with the same attitude Rex has used when addressing the concerns of the residents in QH concerning Rex’s WalMart! Hypocrite! my concern is our desert being riddled with solar panels while all the power goes everywhere else. for letting them use the land people of both cities deserve a break on their bills.what can be expected from a lacacster mayor that lives in palmdale. as much as he hates to admit it palmdale must be doing something right because he doesnt mind using their roads and land. Why? Because logistically it the best location. Its in an industrial area where tge city plans to develop into a business corridor.